Preimplantation genetic screening (PGS) is a very early method of screening the chromosomal make-up of embryos with the aim of increasing the pregnancy rate and reducing the risk of miscarriage for specific groups of patients. These groups include older women, those with recurrent IVF failure or unexplained recurrent miscarriage. Patients in these groups have been shown to be at an increased risk of producing embryos with an abnormal number of chromosomes (aneuploid embryos). In the past, PGS was performed at an earlier stage of embryonic development (day-3) and with now outdated technology, screening only a few chromosomes on each embryo. This approach was not found to be beneficial. Currently, the testing is by means of a technology called next generation sequencing (NGS) or occasionally array comparative genomic hybridisation (a-CGH), which examines all of the chromosomes from a few sample cells, which are removed (biopsied) from each embryo at the blastocyst stage. Blastocysts are embryos which have reached day 5 or 6 of development after fertilisation of the eggs. A blastocyst is formed of over 100 cells arranged in two layers. The inner cell mass will eventually form the baby. The outer cell layer (trophectoderm) develops into the placenta. Five to 10 cells will be removed from the trophectoderm. All the biopsied embryos are then frozen, by means of ‘vitrification’. Once the test results are known, you will commence preparation for a frozen thaw embryo transfer cycle, provided that there is at least one embryo, which has not been found to have any chromosomal abnormalities. The embryo biopsy procedure has been shown not to harm the embryo, when performed by an experienced embryologist. Many studies have shown that the best embryos develop to blastocysts and that blastocyst transfer can give improved pregnancy rates for certain groups of patients. Furthermore, it has also been shown that embryos transferred in a frozen cycle can result in a higher pregnancy rate compared to a fresh transfer. For us to carry out PGS you will have to go through routine in vitro fertilisation (IVF) procedures so that we can generate several embryos. We need to do this in order to increase the chances of obtaining normal embryos. Please read the CRGH link on IVF. What are the risks of PGS? There are some problems that occur during IVF treatment cycles for all patients. These are outlined in more detail in the IVF patient information leaflets. If there are insufficient eggs, or if only a few eggs become fertilised, there is a high risk that no blastocysts will develop. In such cases, the PGS treatment cycle will be cancelled. After the biopsy and diagnosis, sometimes all the embryos are found to have chromosome abnormalities, in which case there will not be any embryos suitable for transfer. It is quite common to find that the majority of the embryos show at least one chromosomal abnormality. The more chromosomes tested, the higher the technical failure rate and the lower the chance of finding suitable embryos for transfer. Despite PGS being performed, there is no guarantee of prevention of a miscarriage or of a live birth. We know that as women get older, there is more chance that they will have a chromosomally abnormal baby, such as Down’s syndrome, and they have an increased risk of miscarriage, which is also due to chromosome abnormalities. Studies have shown that preimplantation embryos from routine IVF patients frequently have abnormal chromosomes in a proportion of cells of an embryo. This is known as chromosomal mosaicism i.e. the chromosomes of the embryo may not be the same in every cell. Hence, the cell or cells we biopsy may not reflect the status of the whole embryo. Additionally, some embryos may be found to contain additional or absent fragments of chromosomes. Again, the significance of such a result is difficult to interpret. Such results will be discussed with you in the clinic and if you require extra information, we are able to refer you for external specialist genetic counselling to aid interpretation. Please note, however, that it is our policy not to transfer embryos in which any kind of chromosome abnormality has been detected, since it is impossible to know how many cells are abnormal and what effect there may be. It is possible that mosaic embryos or embryos with chromosome fragment anomalies may be discarded when they are capable of producing a normal pregnancy. There is also the risk of misdiagnosis of <5%, which can be false positive (the embryo is reported to be chromosomally abnormal when it is not) or false negative (the embryo is reported to be chromosomally normal when it is abnormal). Research (systematic reviews, meta-analysis and randomised controlled trials) has shown a beneficial effect on implantation and pregnancy rate1,2,3,4,5. Some studies have even reported on improved delivery-live birth rate6,7. The clinic will only offer it when your consultant deems it appropriate for the treatment. Additionally, as PGS is only a screening process, we would recommend that our patients, who achieve an ongoing pregnancy, consider antenatal screening tests and prenatal diagnosis tests in the same way as they would have done had they not had PGS. There is the emotional, physical and financial burden associated with assisted conception and PGS. Thus, counselling is offered to all our patients. Whilst this technique is not evidence based, the clinic will only offer it when your consultant deems it appropriate for the treatment. At The Centre for Reproductive and Genetic Health, we are able to scan embryos to pick those most likely to result in a healthy, successful pregnancy, before implanting them into the womb. This is done through a microscopic examination of the chromosomes within the embryos; a procedure known as PGS (preimplantation genetic screening). There is no HFEA – published national average rate for PGS treatment in the UK for the year 01/01/2016 – 31/12/2016. Harton GL, Munné S, Surrey M, Grifo J, Kaplan B, McCulloh DH, Griffin DK, Wells D; PGD Practitioners Group. Diminished effect of maternal age on implantation after preimplantation genetic diagnosis with array comparative genomic hybridization. Fertil Steril. 2013;100(6):1695-703. Chang j, Boulet S, Jeng G, Flowers L, Kissin D. Outcomes of in vitro fertilization with pre-implantation genetic diagnosis: an analysis of the United States Assisted Reproductive Technology Surveilliance Data, 2011-2012 Fertil Steril 2016; 105(2) 394-400. Scott R, Upham K, Forman E, Hong K, Scott K, Taylor D, Tao X, Treff N. Blastocyst biopsy with comprehensive chromosome screening and fresh embryo transfer significantly increases in vitro implantation and delivery rates: a randomized controlled trial. Fertil Steril 2013; 100(3);697-703. Fertility Treatments: What is karyomapping? Genetic screening: What is karyomapping? 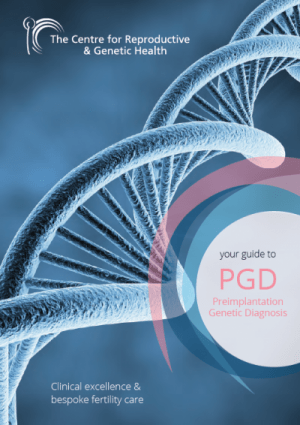 What is Pre Implantation Genetic Diagnosis PGD? What is the process for PGD patients?